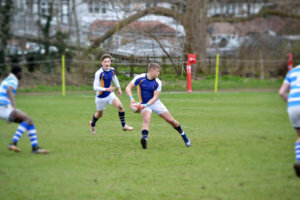 The boys’ rugby sevens sides were in action at the Rosslyn Park National Schools Sevens last week, with representatives of the School taking part in the U14, U16 and U18 tournaments. 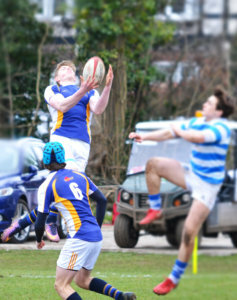 The build up to the showpiece tournament on the school sevens calendar this year was hampered by the changeable weather conditions, with the majority of tournaments having to cancel, but the boys can all come away with a tangible sense of achievement. The U16 tournament began the week’s action and, in a tough group, St Edward’s ran a couple of strong sevens sides particularly close, narrowly losing out to Kirkham Grammar in their opening game and nearly going the distance against John Fisher, who went on to beat or draw with the rest of the group. Maxi Madrian had a good day in both defence and attack, whilst both Daniel Hoggar and Harrison Wells demonstrated their potential, scoring a brace of tries each as members of the Fourth Form playing a year up. The U14s beat Fulham Boys 15-12, but proved not to have quite enough experience in this format of the game this year to take any other scalps on this occasion. There are plenty more tournaments to come for this promising side, and more wins will surely follow soon. The U18s were competing in the National Vase with 180 other schools. The sun was shining on Rosslyn Park, and it was certainly shining down on Teddies too, winning every game of their pool matches, a feat not achieved for at least 12 years. A big win over The Oratory by 38-7 set the boys on their way, with 1st XV captain, Henry Emmott, reprising his role once again in the sevens format. Wins duly followed over RGS, Guildford and Wellingborough, and with that St Edward’s passed on into the elimination round. The progression from the group stages did little to dampen the U18s appetite for success and a further victory followed over a highly regarded Berkhamsted side by 31-14, producing their best rugby of the day. The following morning brought with it the semi-final groups and some strong opposition. St Peter’s, York were close to being overturned at the death with Teddies having a couple of near chances, narrowly losing 19-21. The U18s can be proud of the grit and determination displayed throughout the tournament against more experienced opposition. The lethal finishing of Dekoye Coker and Josh Moore deserve particular note, with eight and seven tries respectively, and Cameron King demonstrated why he has been selected for England Counties matches against Ireland next month. Congratulations to all the boys involved at Rosslyn Park National Schools Sevens on giving a good account of themselves on the world’s biggest schools sevens stage.